What does it take for an activity to become a pastime? The word itself is simple enough. Alone it means the same thing as a hobby. A thing you enjoy and do to get away from the stresses of work or life and just relax. To pass the time. Once upon a time it was well-known that the mantle of America’s Pastime is taken up by baseball. Whether or not that’s still true is a subject for another time. What’s true today is that various states and communities continued to create – and stand by – pastimes of their own. 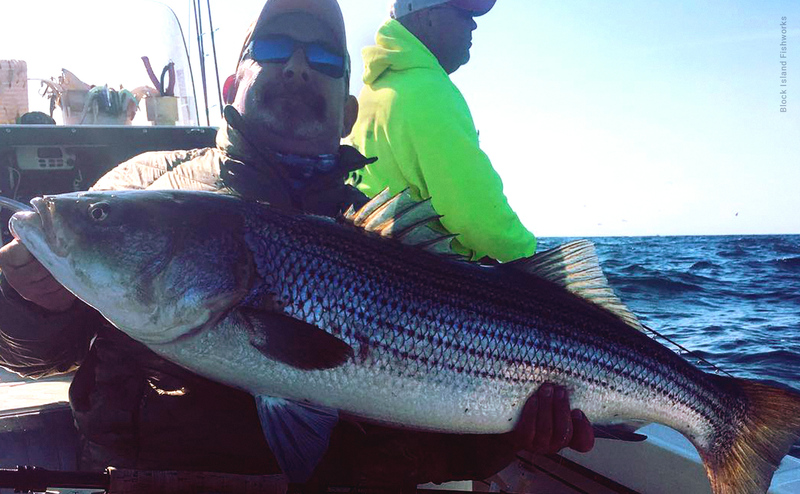 This week we’re looking at one that’s been a Block Island favorite for quite some time: winter fishing. While it might not be the first thing you think about when the idea of spending time on Block Island this winter springs to mind, the colder months are actually a pretty good time of year to head out on a fishing trip. Block Island is ripe with potential. Especially when fishing for cod. Exactly how successful you end up out on the water depends entirely upon how prepared you are. Unless you’re particularly experienced, bait fishing remains your best bet when going out in search of cod. And when you’re on Block Island, the bait that’ll take you the farthest is Atlantic surf clams. The better the cut and quality of these skimmer clams, the more effective they’ll be when luring in those cod. If you find that isn’t working as well as you’d like, spruce things up! Adding some brightly colored rubber curly-tailed grubs to your hooks might make all the difference. Make sure you check the status of your fishing license before heading out. It’s also important to stay up to date with the state’s regulations (risaa.org). You don’t want to miss out on all the fun and relaxation Block Island can offer because of an expired or invalid license. Out on the water, fishing gear in tow, it can be easy to forget that you’re sitting right in the middle of winter. It’s even more important to make sure you’re dressed properly for the cold. Your body heat tends to escape from extremities like your hands and feet, along with your head. Bundling up won’t just make your fishing trip better but help keep you from getting sick so you can enjoy all the other fishing trips to come. There are plenty of reasons why Block Island is different than other such places. Plenty of which you can read about right here on our blog. One reason that can’t be overlooked is the ability to enjoy whatever pastime fits your fancy, no matter the season. Whether it’s your first time or your fiftieth, there’s nothing quite like casting out your line and watching the bobber rise and fall with the tides.